Uglyworld #383 - The De-Frosted Swimming Pool, originally uploaded by www.bazpics.com. 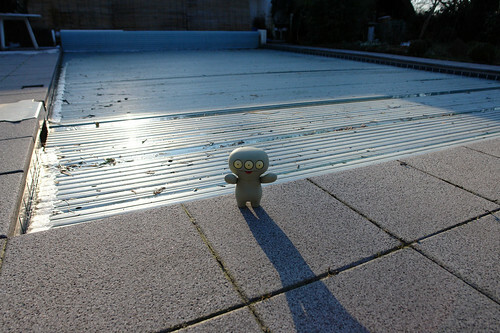 After me panicing this morning upon hearing the noise that little Cinko was able to exhale from his tiny little lungs it turned out that his vocal outburst was due to him finding the swimming pool back in a liquid state, i.e. no longer frozen. It turns out the little guy had planned to practice ice skating all through this coming weekend, which unfortunately doesn't look like it's going to happen. And of course he is afraid of water, so you can imagine.